She was the wife of Pierre Curie, and the mother of Irène Joliot-Curie and Ève Curie. ↑ 2.00 2.01 2.02 2.03 2.04 2.05 2.06 2.07 2.08 2.09 2.10 2.11 2.12 2.13 2.14 2.15 Tadeusz Estreicher (1938). "Curie, Maria ze Skłodowskich" (Polish ভাষাত). Polski Słownik Biograficzny, Vol. 4. পৃষ্ঠা. 111. ↑ 3.0 3.1 3.2 3.3 3.4 3.5 "Marie Curie — Polish Girlhood (1867–1891) Part 1". American Institute of Physics. http://www.aip.org/history/curie/polgirl1.htm। আহৰণ কৰা হৈছে: 7 November 2011. ↑ Robert William Reid (1974). Marie Curie. New American Library. পৃষ্ঠা. 6. ISBN 0002115395. http://books.google.com/books?id=p81XAAAAYAAJ। আহৰণ কৰা হৈছে: 2 August 2012. "Unusually at such an early age, she became what T.H. Huxley had just invented a word for: agnostic." ↑ 5.0 5.1 5.2 5.3 5.4 5.5 5.6 5.7 "Marie Curie — Polish Girlhood (1867–1891) Part 2". American Institute of Physics. http://www.aip.org/history/curie/polgirl2.htm। আহৰণ কৰা হৈছে: 7 November 2011. ↑ 6.0 6.1 6.2 6.3 6.4 Wojciech A. Wierzewski (21 June 2008). "Mazowieckie korzenie Marii [Maria's Mazowsze Roots]". Gwiazda Polarna খণ্ড 100 (13): 16–17. http://web.archive.org/web/20090321193811/http://www.gwiazdapolarna.com/czytaj.php?nr=813&cat=4&art=04-01.txt। আহৰণ কৰা হৈছে: 10 September 2012. ↑ Robert William Reid (1974). Marie Curie. New American Library. পৃষ্ঠা. 24. ISBN 0002115395. http://books.google.com/books?id=p81XAAAAYAAJ। আহৰণ কৰা হৈছে: 2 August 2012. ↑ 8.0 8.1 8.2 8.3 Tadeusz Estreicher (1938). "Curie, Maria ze Skłodowskich" (Polish ভাষাত). Polski Słownik Biograficzny, Vol. 4. পৃষ্ঠা. 112. ↑ Robert William Reid (1974). Marie Curie. New American Library. পৃষ্ঠা. 32. ISBN 0002115395. http://books.google.com/books?id=p81XAAAAYAAJ। আহৰণ কৰা হৈছে: 2 August 2012. ↑ 10.00 10.01 10.02 10.03 10.04 10.05 10.06 10.07 10.08 10.09 10.10 "Marie Curie — Student in Paris (1891–1897) Part 1". American Institute of Physics. http://www.aip.org/history/curie/stud1.htm। আহৰণ কৰা হৈছে: 7 November 2011. 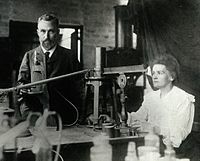 ↑ 11.0 11.1 11.2 11.3 "Marie Curie — Research Breakthroughs (1807-1904)Part 1". American Institute of Physics. http://www.aip.org/history/curie/resbr1.htm। আহৰণ কৰা হৈছে: 7 November 2011. ↑ Robert William Reid (1974). Marie Curie. New American Library. পৃষ্ঠা. 61–63. ISBN 0002115395. http://books.google.com/books?id=p81XAAAAYAAJ। আহৰণ কৰা হৈছে: 2 August 2012. ↑ 13.0 13.1 13.2 13.3 13.4 "Marie Curie — Research Breakthroughs (1807-1904)Part 2". American Institute of Physics. http://www.aip.org/history/curie/resbr2.htm। আহৰণ কৰা হৈছে: 7 November 2011. ↑ "Marie Curie — Student in Paris (1891–1897) Part 2". American Institute of Physics. http://www.aip.org/history/curie/stud2.htm। আহৰণ কৰা হৈছে: 7 November 2011. ↑ Robert William Reid (1974). Marie Curie. New American Library. পৃষ্ঠা. 63–64. ISBN 0002115395. http://books.google.com/books?id=p81XAAAAYAAJ। আহৰণ কৰা হৈছে: 2 August 2012. Teresa Kaczorowska (2011) (Polish ভাষাত). 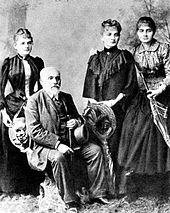 Córka mazowieckich równin, czyli, Maria Skłodowska-Curie z Mazowsza [Daughter of the Mazovian Plains: Maria Skłodowska–Curie of Mazowsze]. Związek Literatów Polskich, Oddz. w Ciechanowie. http://books.google.com/books?id=yTCkXwAACAAJ। আহৰণ কৰা হৈছে: 2 August 2012. Naomi Pasachoff (1 August 1996). Marie Curie:And the Science of Radioactivity: And the Science of Radioactivity. Oxford University Press. ISBN 978-0-19-509214-1. http://books.google.com/books?id=mVCTHbdstdQC। আহৰণ কৰা হৈছে: 2 August 2012. Eve Curie (2 April 2001). Madame Curie: A Biography. Da Capo Press. ISBN 978-0-306-81038-1. http://books.google.com/books?id=abHJGxj8ZRwC। আহৰণ কৰা হৈছে: 2 August 2012. Susan Quinn (10 April 1996). Marie Curie: A Life. Da Capo Press. ISBN 978-0-201-88794-5. http://books.google.com/books?id=bteAVVwkeUIC&pg=PA330। আহৰণ কৰা হৈছে: 2 August 2012. Lauren Redniss (21 December 2010). Radioactive: Marie & Pierre Curie: A Tale of Love and Fallout. HarperCollins. ISBN 978-0-06-135132-7. http://books.google.com/books?id=HVL4QwAACAAJ। আহৰণ কৰা হৈছে: 2 August 2012. Opfell, Olga S. (1978). The Lady Laureates : Women Who Have Won the Nobel Prize. প্ৰকাশক Metuchen,N.J.& London: Scarecrow Press. পৃষ্ঠা. 147-164. ISBN 0810811618. Olov Enquist, Per (2006). The Book about Blanche and Marie. প্ৰকাশক New York: Overlook. ISBN 1-58567-668-3. A 2004 novel by Per Olov Enquist featuring Maria Skłodowska-Curie, neurologist Jean-Martin Charcot, and his Salpêtrière patient "Blanche" (Marie Wittman). The English translation was published in 2006. Marie Curie সম্পৰ্কে ইণ্টাৰনেট মুভি ডাটাবেছত থকা তথ্য – Animated biography of Marie Curie on DVD from an animated series of world and American history – Animated Hero Classics distributed by Nest Learning. Marie Curie – More than Meets the Eye সম্পৰ্কে ইণ্টাৰনেট মুভি ডাটাবেছত থকা তথ্য – Live Action portrayal of Marie Curie on DVD from the Inventors Series produced by Devine Entertainment. "Marie Curie Walking Tour of Paris". Hypatia. http://www.hypatiamaze.org/m_curie/curie_walk.html। আহৰণ কৰা হৈছে: 7 November 2011.